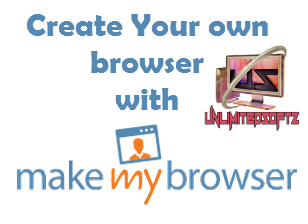 MakeMyBrowser.combrings to you an unmatchable feature to have a personalized browser like Google chrome.You are required to follow a very simple process in order to create your own personalized browser. MakeMyBrowser allows you to have your personal browser with chromium browser as its base. Now you can have access to all your favorite sites and all your accounts inone place. You will save time and efforts by not having tolog into different sites individually. With MakeMyBrowser you can also create a browser for your users in order to increaseusers’ engagement, increase traffic and have your site always showing on your users’ bookmarks bar. Sharing your favorite links and interests always seemed a hassle but with MakeMyBrowser share all your favorite sites and links with your friends in just one click! There is no difference between Google chrome and chromium browser, which isthe base for MakeMyBrowser because both the browsers are based on chromium. They are fast and work withthe Chrome web store. While only one chrome browser can be installed onyour PC, you can have multiple chromium browsers personalized to your own requirements. MakeMyBrowser supports all extensions that support Chrome. Your system will not crash or slow down even if you create multiple browsers on a single PC.Log into your browser with any Google account that will save your bookmarks and passwords online torestore all your information if your system crashes or you lose your laptop. In addition, you can share your browser with yourself as well as your friends. Just click “share browser” from the bookmarks bar. It does not share your personal information like saved passwords or browsing history. So, next time you come to read our blog, make sure that you reading from your own personal browser! About the Author : Jane Davis.MakeMyBrowser Marketing manager.Computer Science graduate from University of Texas Austin.Geek lover, PC enthusiastic and gadget fan. We Created Our Own Browser that makes you easy to connect with our Blog..